Do you wake up in the middle of the night wondering how to do a traffic simulation ? Perhaps its just us then… in which case this is an open question on the best way to visualize traffic in 3D packages such as Max or Maya. The render above is from our first test, we will have more posts on techniques in the next few days but for now any thoughts are welcome. CyberCity 3D can provide high detail city models for use in Maya and 3DSMAX. Could add realism to your rendering by replacing those boxy buildings with realistic 3D models. In general we know how to model buildings, thats not too tricky – ours in the render are simply placement models for the street network. 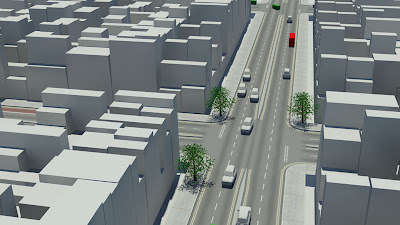 You might want to take a look at our product CityScape (www.pixelactive3d.com), which allows you to view traffic simulations on the fly as you create your city. Aimsun (www.aimsun.com) is a traffic simulation package that offers good integration capabilities, including a comprehensive SDK. Maybe it will be possible to combine it with CityScape, CyberCity 3D, Maya or 3DSMax. The intent is to make a free trafic solution! I think from my toughts, that some sort of free programing solution of how cars should interact in traffic should be built. As when to stop or go, or don’t crash.